which is installed in over 10,000 remote sites around the world. SCADALink products are designed to be rugged, reliable, and Class I Div 2 certified to meet the requirements of industrial environments. 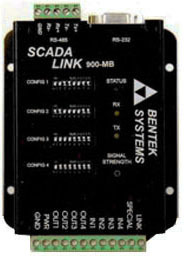 Modbus compatible wireless RTU/Radio Modem integrating a spread spectrum radiomodem with an RTU. Modular Spread Spectrum Wireless RTU / Modem system supporting Modbus RTU & AB DF1 Protocol.